Armstrong Watson Financial Planning and Wealth Management is our independent financial advisory division. Covering all of our offices, our highly qualified and experienced advisers have the expertise to help develop a clear financial strategy that can evolve and grow with your business or personal financial needs. We are proud to be Chartered Financial Planners and recognised by the Chartered Insurance Institute (CII) as an organisation that demonstrates significant commitment to an overall standard of excellence and professionalism. We believe that financial planning is an ongoing relationship where we can support and help you to achieve your goals in life. Our approach is to step into our client’s shoes and see your personal situation from your perspective. This allows our advisors to gather a clear understanding of your aspirations and helps us shape our advice to provide an effective, and most importantly, a personalised planning service to all our clients. No two businesses are the same and whilst there may be some similarities, just like people, each situation is unique. 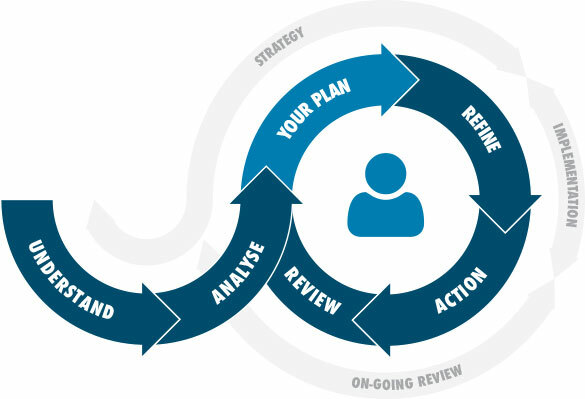 The challenge is how you identify what the right strategy for your business is and this is where our advisors can work with you to ensure that you have a focussed plan as we understand the challenges that businesses face. Our advisers understand the complexities you face when meeting legislative duties and can provide you with professional advice to support you in carrying out your duties effectively as a Trustee or a Charity. How do you identify what the right strategy is for you? There’s a range of financial solutions now available and information can be accessed far more easily with just the touch of a button. Our Financial advisers can work with you to ensure that you have a strategy and a plan focussed on achieving your goals and aspirations. Our usual approach is to arrange an initial meeting which will be covered with our compliments. This will enable our advisors to assess how well we have understood your needs and requirements and be very clear on how it is that we are able to help you to achieve your goals. Read our brochure covering who we are, our approach to advice and where our team are based. We consider it critical for most clients to review their strategy once it has been implemented to make sure it remains suitable and on track. Read about our service here. The decision to retire and when you do it will be the most important decision you will make for the rest of your life. Read our guide to your retirement options. Charities face a number of challenges when it comes to managing money. Read our guide. Protecting you, your business and your employees, read about the tax advantages of Relevant Life Plans. Philip Hammond delivered the 2019 Spring Statement set against a background of continuing Brexit uncertainty. Read a summary of his announcements here. INSIGHT is our FREE quarterly financial magazine packed full of useful and topical articles on financial planning and tax matters affecting you. Download Our Guide to Investing for FREE.